Ha Long Bay is one of the natural wonders of the world and currently the top destination to visit in Vietnam. The UNESCO site, once untouched for thousands of years, is now more popular than ever. 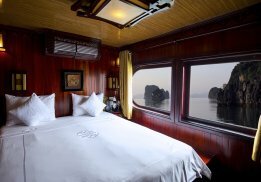 Our route from Ha Long Bay to Bai Tu Long Bay offers the same breathtaking ocean scenery and legendary Karst rock formations without the same amount of vessels or people. The stylish and world-class Athena Cruise is less crowded both the boat and in the water due to our unique and less-traveled route. Our ship is state-of-the-art. The modern and luxurious design will make you feel like you have been invited aboard the pleasure cruise of a movie-star. We have a top-notch wine list and offer a wide variety of liquors, beers, cocktails, coffee, tea, and fresh-made juice. 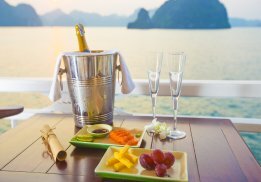 On the Athena Cruise you will receive VIP treatment in our luxurious accommodations while cruising through one of the most extraordinary landscapes Vietnam has to offer. The Athena Cruise is a perfect choice for any special moment such as a honeymoon, anniversary, business meeting, company retreat, family outing, or romantic getaway. Let us make your dream-trip a reality and give you the adventure you desire. 13:15: Enjoy the lunch with the best products of the Bay. 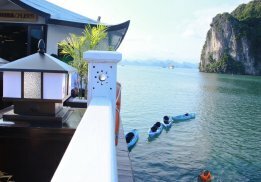 14:45: Visit the Vung Vieng floating fishing village by kayaking 15.30-16.30. If you want to relax on the boat instead of participating in other activities feel free to use our sauna at no extra cost. 06:30: Practice one of the oldest traditions of East Asia: Tai Chi – A beautiful and relaxing experience on the open deck. 07:00 – 08:15: Breakfast is served in the restaurant. 08:30: Transfer on the day boat to start an incredible trip to Ha Long Bay. 12:00: Have lunch on the boat. 15:30 – 16:30: Back to the Athena Cruise and you will have some free time. 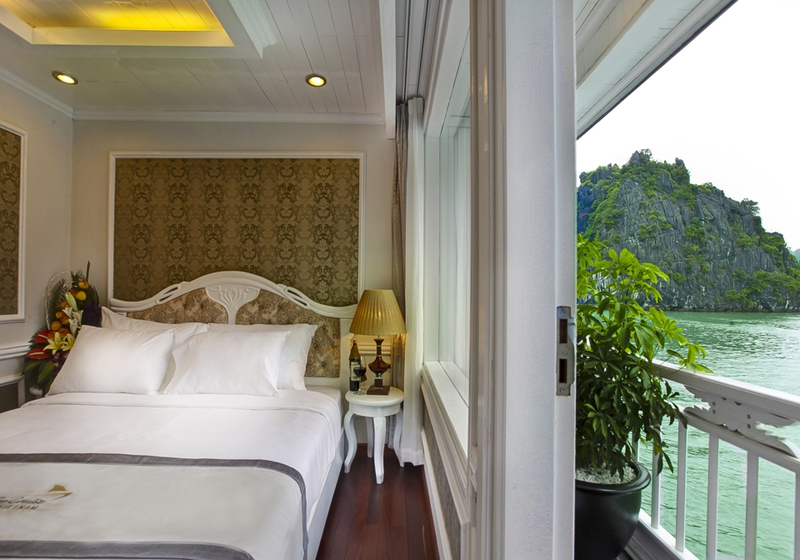 Relax in your cabin or on the Sundeck. 17:30: Cooking class with some new technique to learn. 19:00: The Gala dinner is ready for you. 20:30: Enjoy the Squid Fishing activity.